Northern cardinals eat mainly seed and some insects. Sunflower seed, cracked corn and insects like crickets, spiders and flies are cardinal's favorite food. Wild grape, blackberry and wild berries are also common food for these type of a bird. During winter these birds will mainly eat seed and in mating seasons insect will be fed to the baby birds to provide protein boost. Cardinals have a longer list of preferred food compared to other birds. This inclusiveness also explains why the population of the cardinals is relatively stable and developed. These cute birds are honored in seven US states. The red cardinals that migrate over winter are more likely to eat other types of food in comparison with the cardinals that are non-migratory. Northern cardinals (lat. Cardinalis cardinalis) stay on one location and are limited on what they eat on their year-round location. This birds are seed and fruit eaters and that is a majority of Northern Cardinal food. Insects do make part of cardinal diet: about 1/3 of the food comes from insects like crickets and flies, but only when these insects are active and around. Farmers consider these birds helpful as cardinals eat pest insects that are harmful to the crops, like cotton worms, grasshoppers and snails. That’s why these birds are welcomed friends to our backyard and must be protected. They are attracted to the Cardinal Food Blend seed that you can provide in a cardinal feeder. Hopping on the ground or foraging from the low shrubs and trees - these are favorite food finding tactics of the Northern Cardinals. They have a heavy short and reddish beaks that can easily crush seed. They can eat larger and harder seed types, something that birds with smaller beaks cannot do. The grooved upper mandible holds the sunflower seed firm while the sharp-edged lower mandible slides forward and cracks and husks the food. The bird then swallows the inside nut meat. Large part of researchers believe that Northern Cardinals find a mate for life, but when winter comes, the birds do not feed together. When the new spring season comes in birds are reunited again. At that time you can see the male birds bringing Sunflower Seed to his mate, welcoming her back. Usually she waits looking like a baby bird with her wings all aflutter, all excited and happy. And the male tenderly gives her the food with love, like he is kissing her for the first time. If you install the cardinal feeder, Cardinals will come and eat almost anything provided to them. But the favorite seed is Sunflower Seed, cracked corn and safflower seed. Cardinal Blend seed is their favorite food. The Northern Cardinals will come to your feeder and you will see the distinct reed color of the birds. As only 1/3 of the bird diet is insect, they will come to the bird feeders often. If you have a garden, you can install the feeder next to it and the birds you attract will help by eating the pest on your plants. Check a great cardinal feeder review here. 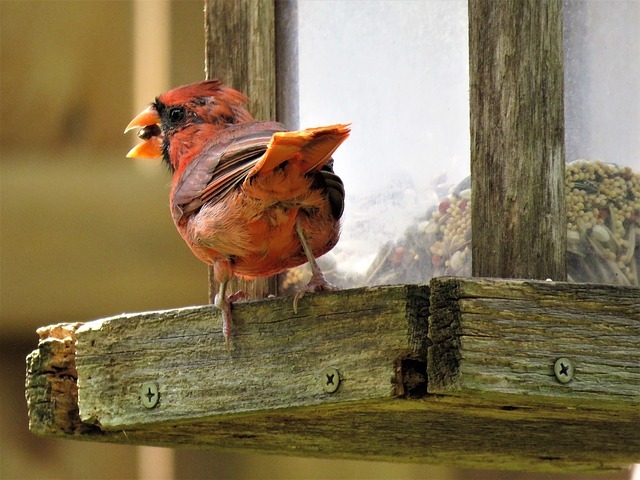 Although cardinals like to eat on the ground, they will readily come to bird tables, trays on posts and trees, window feeders, and hanging feeders with perches provided for them. These birds usually come back to the same feeders every day. Provide water in winter and in summer for the cardinals - the birds find it important year round, but remember to keep it unfrozen. These birds use baths and water supplied all the time, as during the winter times lakes and rivers can be frozen. If the bird uses the bath, it’s going to get wet. In this case it cannot fly as fast as usual, so place it somewhere where birds can see cats and predators. You will find that all variety of birds will come to bath in ponds, streams and lawn sprinklers. What Do Cardinals Eat At Bird Feeders? Cardinal are basically very inclusive to the types of seed to eat. They eat sunflower seeds, squash seeds, black oil sunflower seeds, safflower seeds, and various weed seeds offered at bird feeders. There are two types of sunflower - striped and black oil. Black oil seed (“oilers”) have extremely thin shells. This is because practically all seed-consuming birds must crack it before opening. On top of that kernels inside have thick covering or shell, which is very valuable for the majority of winter birds. Striped sunflower seeds possess a thick shell, which is hard for House blackbirds and Sparrows to crack it. Therefore, if you are inundated with different types of species you will prefer not to subsidize for black oil sunflowers. Before you decide anything else, consider striped sunflowers instead. People residing in flats have difficulty in collecting seed shell below their feeders that generally offer shelled sunflowers. Several birds enjoy this, and obviously squirrels too, but it is very expensive. With no protection from shell, sunflower's chips and hearts are spoiled quickly and may harbor harmful bacteria. Therefore it is essential to provide quantity which can be consumed within couple of days. Sunflower is appealing to squirrels. So it becomes an issue for those who do not want to feed them. Some types of squirrels baffle, while some specific feeders are comparatively good in excluding them. Sunflower within the shell could be offered in various types of feeders, such as tube feeders, trays, hoppers, as well as acrylic window feeder. Sunflower's chips and hearts should not be offered to tube bird feeders where moisture can easily accumulate. Safflower has a thicker shell, which is difficult for few birds to break, but it is preferred by cardinals. Some chickadees, grosbeaks, doves, along with native sparrows consume it. Based on a few sources, European Starlings, House Sparrows and squirrels do not like safflowers; however, some birds have developed the taste of safflowers. Grosbeaks and Cardinals generally prefer trays along with hopper feeders that make these types of feeders a great choice for safflower. Corn is consumed by pheasants, grouse, turkeys, cardinals, quails, grosbeaks, ravens, crows, jays, ducks, doves, cranes as well as other species. Sadly, corn has two major issues. Firstly, it is very popular among cowbirds, Home Sparrows, geese, bears, starlings, raccoons and deer. Secondly, corn is a bird food, which is polluted with aflatoxins that are very harmful even at lower levels. Never ever buy corns in a plastic carry bags, never allow it to get wet and do not offer it in quantities that cannot be eaten in one day. During rainy season be careful about stocking old corn. Do not offer corns, which are marked red. That corn is meant for planting and it is usually treated with fungicide and is marked red as a sign of warning. It is extremely harmful to human beings, livestock as well as all the birds. Never ever offer buttered popcorns or any type of microwave popcorns. Popped corns are spoiled quickly. Corns are ought to be offered in a reasonable quantity at any given time on the tray feeders. Do not offer it within tube feeders that may have moisture in it. If you want to attract more variety of birds than offer a mix seeds. This Cardinal Food Blend mix is a great choice for attracting these birds! Most of Red Cardinals aren’t migrating anywhere and are well adapted with human civilizations like villages, towns and suburbs. That’s why their diet is relatively inclusive compared to other migrating bird species. They eat apples, cherries, blueberries, raisins, grapes, strawberries, raspberries and so forth. In fact, you wouldn’t have to specifically buy certain fruits, just share yours with them. Offer it on a tray in your backyard and cardinal and other small bird will come to snack on them. How To Attract Cardinals And What Bird Feeder To Get? The presences of Red Cardinals help farmers and gardeners to some extent by consuming the harmful pests including snails, slug, grasshoppers, bollworms, aphids and so forth. They also eat the spiders, centipedes, beetles, flies, crickets, katydids, worms and moths. You can simply provide some fruits, grains or seeds and cardinal will protect your garden from pests. The perfect cardinal feeder is strong enough to last entire winter season and protect from squirrels. It is tight enough to maintain seeds dry - simple to assemble and, most importantly, simple to clean and maintain. Hollow pipes or tubes maintain seed relatively dry and neat. If it has metallic feeder port, it can also become squirrel proof (though squirrels frequently chew end caps or even plastic pipe itself). Depending on the scale of these perches beneath the feeding ports, you might attract small bird species such as sparrows, cardinals, chickadees, grosbeaks, finches and titmice while avoiding bigger species like jays and grackles. This type of feeder safeguards seeds (comparatively better) from bird droppings and weather. However, if this seed within hopper gets wet, fungus and bacteria can definitely thrive. Hopper Bird Feeders are alluring to most feeding birds, such as jays, finches, buntings, cardinals, sparrows, grosbeaks, titmice and chickadees. They are also considered as squirrel magnets. Several hoppers are capable of holding sufficient seeds that can last for few days, making it convenient for them, but harmful for birds when these seeds get wet. Many of these hopper bird feeders are difficult to clean up in comparison to tray feeders. Hopper feeders may be installed on pole or even suspended. Remember, the squirrel baffle is very important if you do not wish to attract them. Cardinals do not migrate and as a result they usually spend entire lives within one or two mile radius of the place they were born. 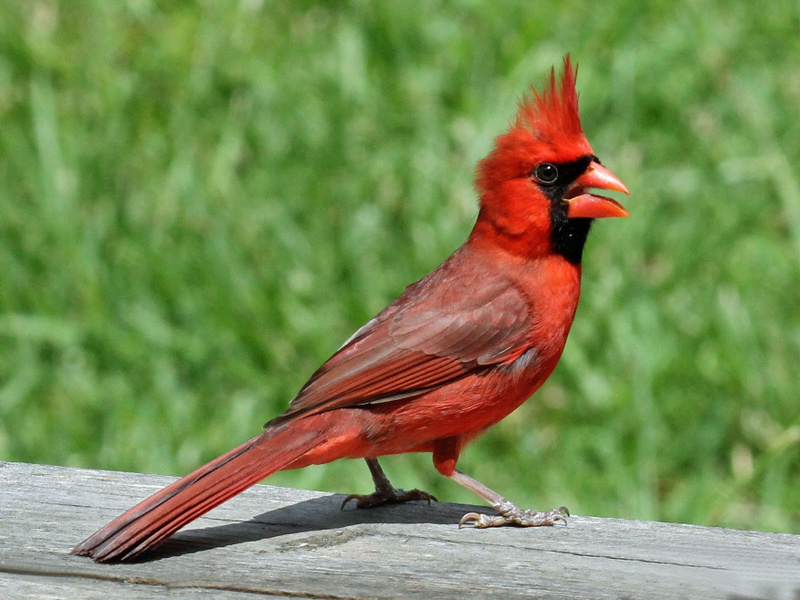 In the United Stated of America, the cardinal is the official bird of seven states. These states include: Illinois, Indiana, Kentucky, North Carolina, Ohio, Virginia and West Virginia. Unlike most wild birds, Cardinals appear to actually benefit and flourish from the growth of urban cities. With so many city parks, backyards and homes offering bird feeders, cardinals are growing and thriving. Since the eighteenth century, the cardinal population in the continent and popularity have been growing steadily. 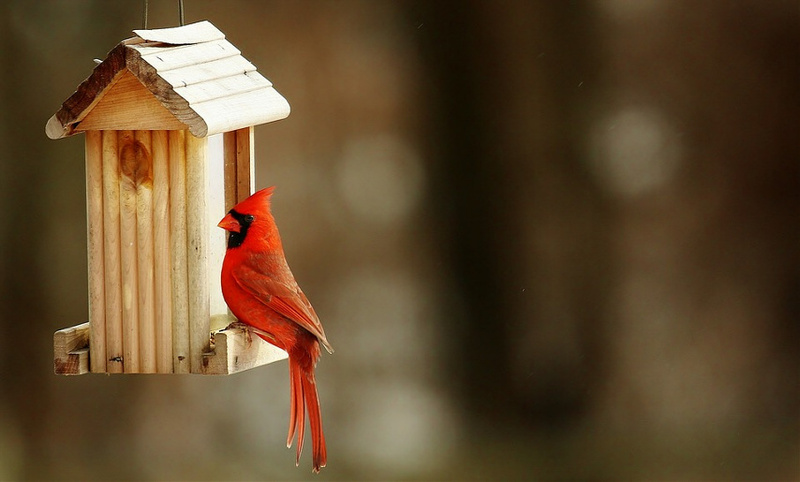 Can i attract cardinals with a bird house? 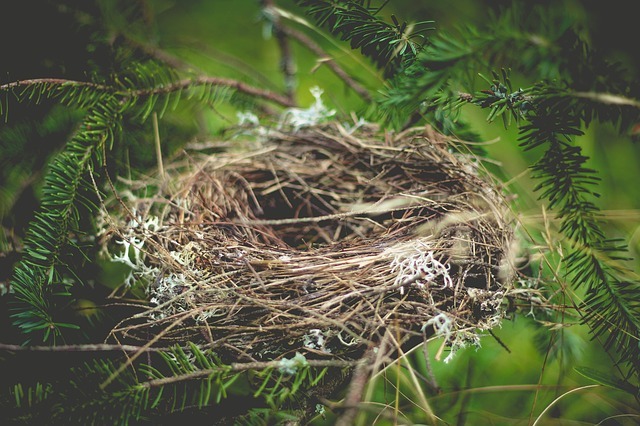 Cardinals build open nests and are not cavity nesters. . Since cardinals do not stay and build the nest in birdhouse you can install it to attract other birds, by installing a Backyard Bird houses a new family can inhabit it every year. Sometime other birds will nest in the box, and you can enjoy them. Cardinal build nests from dry leaves and twigs, combined with types of dry grass and slips of grapevines is in the area. It is usually finished off within with nice bent grass, wrought in a circular form. Cardinal eggs in the nest may number from just three to even six and are of a bluish beige color, and are marked with little of olive-brown. Cardinals are one of the cutest birds in our backyards and you will be most happy to see them in your garden all year round. Make sure that your garden stays clean and bird friendly all the time.